Studying Shakespeare with your homeschoolers this year? Download this free copywork guide from our friend, Kat Patrick. Kat has lived and homeschooled (and studied Shakespeare) in England. She teaches Shakespeare (and many other fine courses at Dreaming Spires Home Learning). 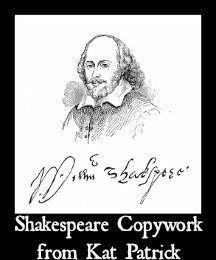 Kat is sharing a freebie chapter of her Shakespeare Copywork Guide with us to help homeschoolers (middle school and high school) internalize favorite soliloquies and quotes. This is a Charlotte Mason style learning activity AND excellent activity for all homeschoolers studying Shakespeare. Listen to Homeschool Highschool Podcast Episode 104: Teaching Shakespeare and LOVING It! (Interview with Kat Patrick). AND download this freebie.